Arjun is the Founder & Managing Partner of TeleSoft Partners, a venture capital firm focused on high-tech startups. Arjun has over 25 years of experience working with technology companies in venture capital, consulting and design engineering roles. At TeleSoft, Arjun manages capital commitments of $625+ million and has established Corporate Partnerships in Israel. In 2001, Arjun, started a family foundation to support projects in education, medical research and the arts. Over the last eighteen years Arjun has overseen investing in and helping build ~61 private companies, resulting in ~38 mergers & acquisitions and IPOs to date with a combined current market equity valuation or cash equivalent of ~$18 billion (post bubble). Based on the private equity IRR data (disclosed by CalPers, CalSTRS, University of California, University of Michigan, UTIMCO and Washington State) on ~600 private equity funds from 1981-2002, the track record of TeleSoft and its principals has consistently been in the top 10% of the industry. He was ranked by Forbes Magazine in the Top-100 technology venture investors on the 2006, 2007, 2008 and 2009 Midas Lists. Arjun serves on the boards of Calient, Knowledge Adventure, and Nexant. He is also on the boards of the The Aspen Institute, Stanford Business School Management Board, India America Council, Aspen India, The East Africa Leadership Foundation and YPO/WPO Aspen Chapter. Earlier in his career, Arjun was a Strategy Consultant for high-tech clients with McKinsey, where he led top management projects for Apple, AT&T/AirTouch, AMD, Siemens/ROLM and Vodafone. Prior to McKinsey, he was a Software Engineer with Tektronix. Arjun received his MBA from Stanford University Graduate School of Business, a MS and BS in Computer Science, Phi Beta Kappa , from Washington State University, and a BA ( honors ) from St. Stephen's College (India). 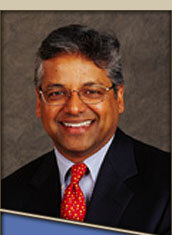 Arjun is a Henry Crown Fellow at the Aspen Institute and an Advanced Leadership Fellow at Harvard University.